Click on the 'directions' on the Google Map and type in your address to find the quickest way to the festival. The Herb and Chilli festival is really easy to find. Follow the signs from Lilydale to the festival. Take the Ringwood Bypass exit from Eastlink and head east on Maroondah Highway to Lilydale. After Lilydale turn right along the Warburton Highway for about 7km to Wandin. Turn right after the roundabout in Wandin along Beenak Road. At the top of the next hill turn left into Quayle Road. Journey time is approximately 2 hours from Flinders Street station and includes a 15 minute walk. 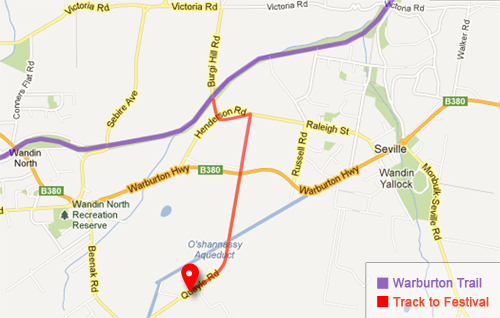 Take Warburton Trail east from Lilydale Station through Mt Evelyn over Warburton Highway and up past Wandin to Burgi Hill Road (second road after Warburton Hwy) - about 13kms. Turn right up Burgi Hill Road, Left into Henderson Road then right into Wallace Road. Over Warburton Highway and along Quayle Road for 1 km. It will be signed from the trail to the festival. We have a dedicated area for bicycle parking. If you need some additional help in coming to the festival for the weekend, the links below may help with your arrangements. In addition to the above, you can also search and compare the prices of accommodation in the area with Trivago.com.au, stayz.com.au, and Airbnb. For a list of accommodation close to the Festival, you can visit our festival accommodation Trivago page here.